The tragic Chicago Tylenol murders, that took place in the fall of 1982, shook the confidence of American people in the Tylenol brand. The first person to die was twelve-year-old Mary Kellerman after she took an Extra-Strength Tylenol capsule. Six more people died before authorities determined that Tylenol sold in the Chicago area was the common factor. Testing the remaining pills in the victim’s Tylenol bottles revealed the presence of cyanide. Someone, who was never caught, had tampered with the packaging! contamination of recently purchased Tylenol products and recalling what was on store shelves. In the short term, their share in the analgesic market crumbled from 35% to 8%. How would they ever restore people’s trust in their pain relievers? Rebuilding consumer confidence required destroying 22 million bottles of Tylenol capsules and developing the first tamper resistant packaging with three layers of protection (sealed box, shrink wrap around the closure, and a sealed liner). This also led to the development of the first-ever Child Resistant Cap—which has saved many lives over the years. It was in this climate of consumer fear and new government regulations, that Pano cap created the first Tamper Evident (TE) closure in 1983 as a way for companies to reassure customers that their products were safe and secure. Tamper Evident packaging is a regulatory requirement for supplements, some nutraceuticals, medications and other pharmaceuticals. Tamper resistant packaging, including Tamper Evident closures, are often used for food or beverages such as sports drinks, coconut oil, salad dressing, Nutrition Powders, and juice. In addition, many third-party logistics companies require Tamper Evident packaging to ensure courier shipping remains intact. Pano Cap’s innovative Tamper Evident™ closures include a perforated plastic band that is manufactured as part of the closure. There is no doubt when the seal has been broken and the seal can’t be reproduced. Paired with heat induction sealed liners (with or without easy-lift tabs) they ensure that consumers can trust your products. 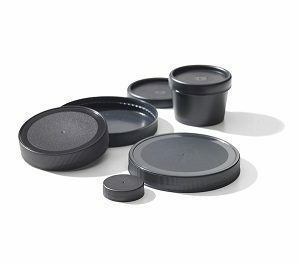 During our long history of manufacturing these specialized caps, Pano Cap has developed North America’s largest selection of Tamper Evident™ Closures. Provide clear evidence of tampering. See our complete selection of Tamper Evident™ Closures. With our in-house design and development capability, Pano Cap can also manufacture a custom solution to help you create tamper resistant packaging that will give consumers confidence in your products. CONTACT US to order samples or for assistance choosing the right closure solution. NEW PRODUCT: Introducing 3 New Smooth Wall Closures! Are these the right closures for your products? With our in-house design and development capability, Pano Cap can manufacture new products to meet market needs. 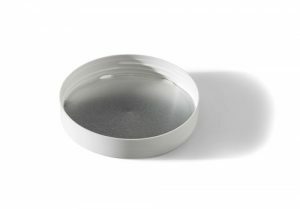 Our new 120mm Deep Skirt smooth wall closure with standard 400 thread finish is an excellent choice for nutraceuticals, powders and personal care products. The closure’s smooth, polished top and sides make your package a pleasure to open every time. A top ring prevents your coloured closure from getting scratched during lining. Spring of 2019, we will offer new 89mm and 110mm shallow skirt smooth closures to complement the 120mm deep skirt smooth. Perfect for all brand categories. The 89mm and 110mm shallow also feature a top ring that prevents scuffing withc coloured closures. Vented hex tab liners (pictured) are recommended for the 120mm deep skirt smooth wall closure. Also available in a round cut liner or tri-tab cut liner. There are a wide variety of liner options available. The 89mm and 110mm shallow skirt smooth can be lined with a round our tri-tab cut liner. Let us help you choose the correct liner and liner cut for your closure. You can order 120mm deep skirt smooth wall, 89mm shallow skirt smooth wall and 110mm shallow skirt smooth wall closures in a selection of stock colours or have your custom colour matched. We offer low minimum order quantities (MOQ). All three sizes come with 24 boxes per pallet. Each pallet of 120 mm Deep Skirt Smooth Wall closures contains 5,760 caps, 110 mm has 8,500 caps/pallet, and the 89 mm 13,800 caps/pallet. CONTACT US to order samples or for assistance choosing the right closure for your products. The plastic recycling industry hasn’t always been widely accepted. This is often because early recyclers paid little attention to quality control, contamination, and durability of their products. However, Pano Cap has found KW Plastics in Troy, Alabama to be a manufacturer of high-quality recycled resins. 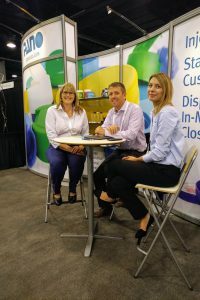 KW Plastics is the world’s largest plastics recycler and post-consumer resin (PCR) supplier for High-density polyethylene (HDPE) and polypropylene (PP). We are pleased to offer their KWR 621 FDA to our customers for environmentally friendly PCR closures. In 2013 KW Plastics received a letter of no objection (LONO) from the U.S. Food and Drug Administration’s Center of Food Safety and Applied Nutrition for the recycling process to produce post-consumer PP. The resin, commercially referred to as KWR 621 FDA, is a food-grade PP resin and has been approved for levels up to 100%. The source material used in KWR 621 FDA is strictly controlled. It is derived from post-consumer rigid packaging items that have been diverted from landfill and recycled—such as yogurt and cottage cheese containers. After it is delivered to KW Plastics the recycled plastic is inspected. It is then ground, washed, and stored in flake form. Subsequently, it is extruded into pelletized form and transferred to 200,000 lb blending silos where it is assigned a lot number. To ensure impurities don’t get into the PCR, after the post-consumer scrap is washed, it is extruded through vacuum-vented extruders that have been outfitted with state of the art Ettlinger Melt Filtration Systems that can filter to 200-microns. The resulting resin pellets are light gray in colour with some minor aesthetic surface imperfections such as specs or color swirls. Through creative packaging design, the resulting plastic can be enhanced with darker pigments or the existing colour and variations can be a featured as a benefit to environmentally conscious consumers. As well, when light colors are required, smaller amounts of PCR can be blended with virgin PP. KW Plastics reports that PCR is popular for personal care packaging such as: caps, closures, tubs, lids, razor handles, tubes, toothbrush handles, etc. Pano Cap has successfully manufactured containers and lids manufactured from 100% PCR material for Lush Fresh Handmade Cosmetics an international cosmetic manufacturer and retailer. Contact Pano Cap to discuss using PCR in your next sustainable closure project. We can help you decide on the right mix of virgin materials to PCR, colour, and other specifications. Committed to minimizing our environmental impact, Pano Cap is a zero waste to landfill company. Our closed loop system reuses all reground materials and recent plant improvements have reduced our carbon footprint. Read about Pano Cap’s commitment to the environment. 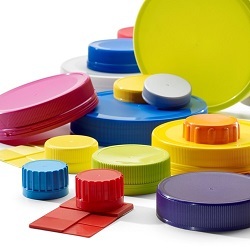 There are several things to consider when choosing a plastic cap for your products. First, you need to know the precise neck size of your bottle, jar or container and what type of plastic it is made of—ask your packaging manufacturer. Then you need to select a compatible sized closure. Pano Cap offers standard 400 finish plastic caps from 28mm- 120mm, as well as, 28mm flip caps. See our full selection of sizes. You will also need to choose a shallow or deep skirt for your cap. The height of your bottle neck may dictate the depth of your closure. With shorter necks you can only use shallow skirts. Closure depth impacts the look and feel of your package and affects how it is capped. Our sales staff can walk you through the right choice. Another feature that shapes the look and feel of your package is the texture of your closure. Depending on your product and your end-users, you could choose fine ribs, coarse ribs (which make gripping and opening easier), or a smooth surface. Tamper Evident caps deter opening products before purchase, prevent removing or poisoning products, improve closure strength during shipping, protect the liner and provide clear evidence of tampering. Pano Cap pioneered the first Tamper Evident (TE) closure in 1983 and continues to provide the widest selection of innovative secure closures in North America. TE closures come with shallow or deep skirts. TE closures are a regulatory requirement for supplements and other nutraceuticals, as well as, medications and other pharmaceuticals. They are often used for food or beverages such as ketchup, mayonnaise, coconut oil, salad dressing, nutrition powders, milk or juice. Liners are the material that sits between a closure and your bottle or jar. Many dry, solid products don’t require a liner, while liquids, powders, and pastes do. Liners help with proper sealing of products and often improve the fit of a cap. Liners touch your products; therefore, it is critical that they are chemically compatible. Choosing the wrong liner could shorten shelf life or lead to leakage during shipping. Pano Cap heat induction liners are available in Full Weld Seal and Easy Peel. Our liners come in round cut and tabbed options. Tabs help to keep the liner in place during the capping process and give your customers something to grasp as they remove the liner. Review our selection of commonly used cap colours or suggest your own. We offer low minimum order quantities (MOQs) on stock colours and custom colours. 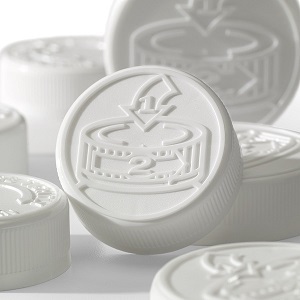 To enhance the attractiveness of your packaging, Pano Cap offers custom embossing (raised design or lettering), debossing (recessed design or lettering), and In Mold Labelling—a new process where labels are molded directly into the caps to avoid fading, scratching, tearing and moisture damage. As an innovative company with an engineering department, full tool room, flexible mold machines, and a modern manufacturing line we can create a custom solution for your unique products. Talk to us about special considerations from additives, static control, and freezing to PCR options and environmentally-friendly materials. To ensure there are no delays with delivering your products to market and no costly missteps, involve your closure company when you begin designing your packaging. Pano Cap can provide neck finish drawings and samples to your new equipment suppliers and help to solve problems that arise. We can also recommend product filling partners, packaging manufacturers, and other trusted partners.